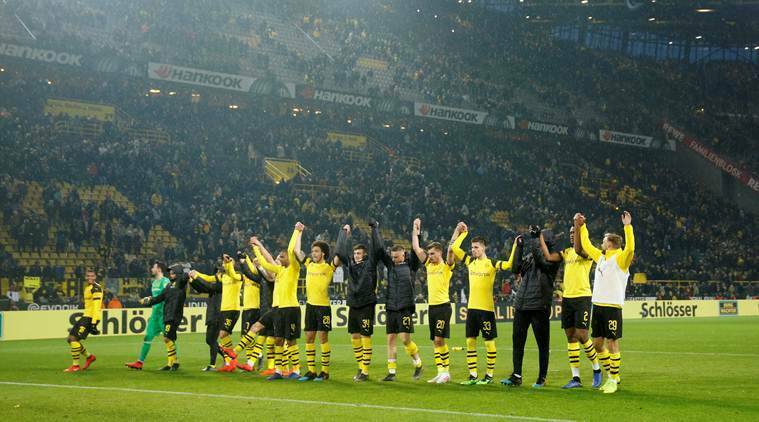 Jadon Sancho scored twice for Borussia Dortmund to return to the top of the Bundesliga with a nervy 2-1 win over Mainz on Saturday. The 19-year-old England forward helped Dortmund get over its 5-0 drubbing at Bayern Munich the week before as it reclaimed the lead by two points from the six-time defending champion. But Dortmund was hanging on at the end after Robin Quaison pulled one back in the 84th minute and Roman Buerki made three successive saves from Ridle Baku, only stopping the ball on the line. Bayern can retake the lead again Sunday with a win at promoted Fortuna Duesseldorf, which grabbed a 3-3 draw in Munich earlier in the season. “If we win all six games, then Dortmund can do what it wants,” Bayern coach Niko Kovac said. Mario Goetze returned for Dortmund after starting on the bench in Munich last Saturday, and the World Cup winner made an immediate impact as he set up Sancho to open the scoring in the 17th minute. Goetze was involved again seven minutes later as he sent Thomas Delaney through to set up Sancho, who scored his 10th Bundesliga goal of the season with a defected shot. Dortmund was producing a spectacle of attacking football but Mainz improved late in the first half when Karim Onisiwo struck the post. After the break, Onisiwo again hit the post and the home fans’ frustration grew as their side looked increasingly nervous. Marco Reus should have sealed it late – after being set up by Sancho – but the Dortmund captain scuffed his shot when he only had the goalkeeper to beat. Leipzig closed in on Champions League qualification and Werder Bremen boosted its hopes of European soccer with wins earlier Saturday. Leipzig consolidated third place after stretching its unbeaten league run to 11 games with a 2-0 win over Wolfsburg. Two late goals from Davy Klaassen and Theodor Gebre Selassie gave Bremen a 2-1 win at home over Freiburg. Bremen remains unbeaten in 2019 _ six wins and six draws in the Bundesliga, two German Cup wins over Dortmund and Schalke _ and climbed to sixth, the last qualification place for the Europa League with five rounds remaining. Seventh-placed Bayer Leverkusen is just one point behind Bremen after ending a run of three defeats with a 1-0 win at Stuttgart, thanks to Kai Havertz’s second-half penalty. Stuttgart’s Santiago Ascacibar was sent off after apparently spitting at Havertz in injury time. The Argentine could face a lengthy ban after pushing referee Tobias Stieler when he was shown the red card. Fifth-placed Borussia Moenchengladbach won 1-0 at bottom side Hannover. Lars Stindl’s return to Hannover quickly ended after a collision with Matthias Ostrzolek in the first minute. The Gladbach captain had to be helped off the field in the fifth minute before he was taken to the hospital.